Pigeon Forge Cabins and Gatlinburg cabins and chalets for your lodging comfort. 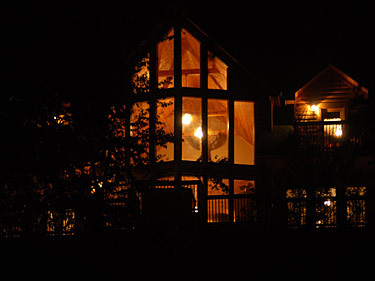 Aardvark Smokey Mountain Cabins is the perfect place to plan your honeymoon or family vacation. 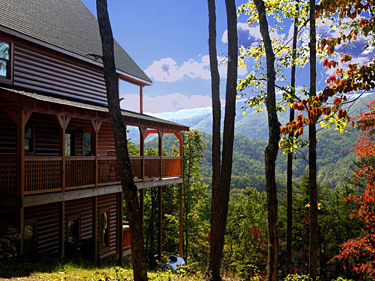 Nestled up against the Great Smoky Mountains National Park, Our Smoky Mountain Cabins feature magnificent and beautiful views of the Smokey Mountains. While here you may be interested in Smoky Mountains Real Estate. March Super Specials are available - Call Now - Click "Last Minute Specials"
Additionally, we have secluded properties with wooded views. Nearby you will find all you need for a fun vacation or holiday. The brand new Ripley's Aquarium is just downtown on the strip. For those of you who like to shop, the Gatlinburg strip contains many unique shops containing many various items, gifts, novelties, etc... to peak the interests of people of all ages. For winter vacationers, Gatlinburg is a wonderful place to enjoy WinterFest. A Smoky Mountain Christmas is one you will always treasure. Craft shows, Christmas parades, sleigh rides, hay rides, trolley tours, Ober Gatlinburg 's Christmas on Ice, and many other events make this holiday season one to remember for a lifetime. Dollywood 's 2004 annual Smoky Mountain Christmas can be enjoyed by children of all ages. Ride the Arial Tram up to Ober Gatlinburg on top of Ski Mountain, a skiing resort and amusement park and shopping mall. Additionally, there is an ice skating rink which is open year round..
You will find an incredible variety of restaurants for your dining pleasure right downtown within walking distance of major attractions, hotels and motels, the Gatlinburg Convention Center. Also, there are museums and other exhibits of interest, including Ripley's Believe it or Not. Something for everyone. Of course, there is no better place in the world to have your wedding, honeymoon and/or anniversary. Wedding chapels abound, with a variety of packages to meet the needs of small or large wedding parties. Gatlinburg now exceeds Las Vegas for the amount of weddings performed each year. 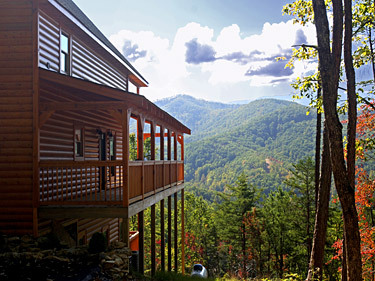 Our Gatlinburg cabins and chalets provide you with all of the comforts of home, and much more. Our rentals are beautifully appointed, and include full kitchens, hot tubs, fireplaces, jacuzzis, TVs, VCRs, pool tables and more. In most cases, the hot tub will be located on a deck with a view and privacy. Some of them are even more secluded. Nearby, you will also find Pigeon Forge and all of the amusements that are there. Also, Dollywood, the most popular theme park in Tennessee. A little further and you will come to Sevierville and Governor's Crossing. And don't forget all of the theatres with music, comedy and variety shows. * The level of water in creeks and rivers is dependent upon rainfall and other weather conditions and thus can not be guaranteed for any particular stay.